This issue of Justice League of America’s Vibe (wow, what a long name!) marks the start of Sterling Gates’ run as writer for the title. If this issue is any indication, Vibe is in very good hands…and I can only wish to see Sterling Gates write more stories that include Kid Flash as well. Gates truly gets his characters – the transition for Cisco is smooth as glass from Johns to Gates, and this issue has just about the best characterization of Bart Allen that we’ve seen in the New52. Vibe is well worth the read, and this series is quickly becoming one of the very best the New52 has to offer. SOME SPOILERS AHEAD – DO NOT READ FURTHER UNTIL YOU HAVE READ THE ISSUE! Vibe picks up with Cisco on patrol, trying his best to take on the responsibilities of being a hero. However, he is also a hero who is late for dinner, and his brother will only cover for him for so much longer. What neither of them realizes is that A.R.G.U.S. is monitoring their conversation, and that they have other plans for the evening. Amanda Waller points Vibe straight at Kid Flash, in an attempt to see how he can handle someone with a link to the Speed Force. If all goes well, the intent is to have Vibe ready to take on Barry Allen – but first we have this supposedly easier trial by fire. Amanda Waller lies (of course) to Cisco, claiming that Kid Flash is a “thief and an arsonist” who “may be a breacher”, and the A.R.G.U.S. teams goes to New York City to capture him, led by Cisco. Vibe does detect something…which we later are led to believe is the extra-dimensional Speed Force energy that fuels Bart’s powers. Bart does appear to be different than the breachers Cicso has met before…which makes sense as Bart is not extra-dimensional but rather from the future. 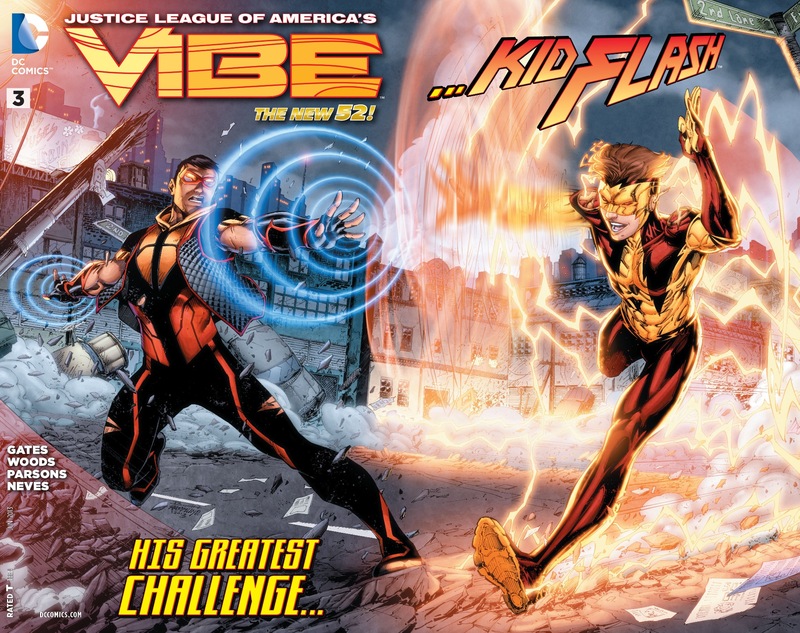 The truly interesting part is what happens with Vibe and Kid Flash make contact…something very strange happens that gives glimpses into Bart’s past to Vibe! At the same time, the feedback from this contact reaches all the way back to Detroit…frying some files and potentially allowing one of the breachers to do something that has implications for the future. The two of them eventually find the exact spot where Bart first appeared in our time, marked by the same lightning-bolt emblem Bart wears on his costume. But, before Cicso can make contact again to find out more about Bart’s “future past”, Bart stops him…and points out that Vibe may not be working for the good guys. He escapes before the A.R.G.U.S. team can catch up to Cisco. Amanda Waller is surprisingly not displeased, though, as they have learned a lot more about the moral make-up of Cisco, and they found that Vibe could indeed briefly (just for nanoseconds)sever Bart’s connection to the Speed Force…storing that little nugget of information away for future use. Back at A.R.G.U.S. HQ, there is one more surprise…but you’ll have to read the issue for that. It relates to what happened during the brief period that Kid Flash and Bart made contact, and it is a very welcome development for anyone following Justice League of America. And, Vibe has a surprise visitor at home…but we won’t learn more about that until next issue. Sterling Gates has done a great job in further developing Vibe’s character, without causing even a blip in the transition of writers. And, Gates gets Bart Allen – this is the best portrayal of Bart I’ve seen in the New52. I can only wish to see more of Gates writing Bart’s character in the future. Pete Woods and Sean Parsons handle the pencils and inks with Fabiano Neves – their artwork is excellent throughout. Brett Booth works with Norm Rapmund and Andrew Dalhouse on the cover. Bascially, this issue has it all – great story, excellent character development, wonderful art – stop reading this review and just go out and buy it already, will ya? Vibe is well worth the read! 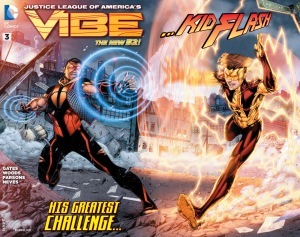 This entry was posted in Reviews and tagged Bart Allen, Kid Flash, Sterling Gates, Vibe on April 17, 2013 by Ed Garrett.